6 Where can I get a Key Crack? If you already have the game installed on your computer and you mislay your license key, you can find it by looking in your system registry. There is a nifty little program by OtherworldBob which can retrieve your keys from the computer's system registry, and allow you to print them out. 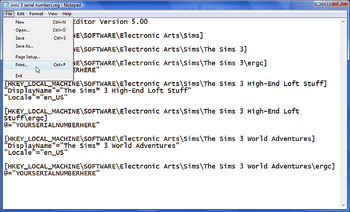 You can obtain it from here or from the Sims2Key Printer website. This program requires .Net Framework 2.0 to run. Warning: Although this method does not require that you edit the registry, please note that you can seriously damage your system by deleting or altering registry keys. Make sure that you back up all important files often. Go to the computer the game is installed upon. 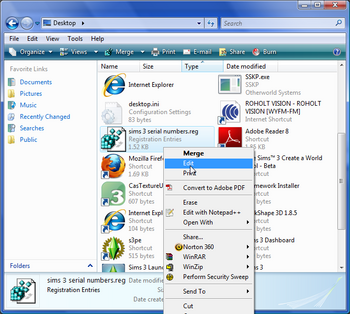 If the computer is using Windows XP, 98, or any older version of Windows, click Start > Run; in the box, type regedit and hit the enter key. 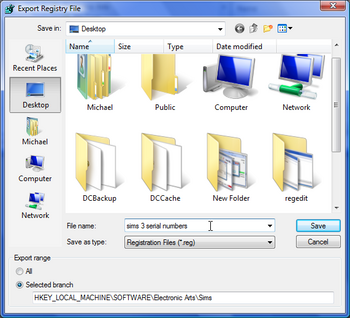 For Windows Vista or 7, type regedit into the "Search programs and files" box, then click regedit.exe. If you need the key for one of your expansion packs, look under the appropriate folder in EA Games, such as The Sims 2 Open for Business. In the pane on the right, you will see a line named default, reg_sz. In the column entitled Data you will see a string of letters and numbers. This is the license key for your copy of The Sims 2. Write it down in a safe place - some people write it on the Sims 2 disc with a special CD/acetate pen (NOT a ballpoint pen! ), or on a bit of paper inside the CD case, or even into a text file that you can save somewhere you'll remember. When you have finished, close regedit. Game Key Revealer 1.6.2 - Simply download, extract to a folder, and run it. Small, simple to use, nothing to install, and will save a text file of the games you have and their keys. In the pane on the right, you will see a line named default, reg_sz. In the column entitled Data you will see a string of letters and numbers. This is the license key for your copy of The Sims 3. Write it down in a safe place - some people write it on the Sims 3 disc with a special CD/acetate pen (NOT a ballpoint pen! ), or on a bit of paper inside the CD case, or even into a text file that you can save somewhere you'll remember. While you're in Regedit, you can copy the section with your serial key(s) to the desktop and even print a copy if you want. Select the folder you want to save in like "Desktop"
Make sure "Export Range" is set to "Selected Branch"
You should now have a Notepad Window open with the file you just exported. If you registered your game online during installation, or on the Sims 2/3 official site or the EA Games site then you can find out the license key by logging into your account. Go to www.ea.com (Sims 2) or to www.thesims3.com (Sims 3) and select your region. Enter your username and password. This is the same username and password as you use to log into the Sims 2/3 official site to get to the BBS or the Exchange. Enter your username and password again. You may have to enter your password twice for security. Click on the 'My Games' tab. You will see a list of all the games you have registered, plus the registration codes. It would be a good idea to write these down and keep them in a safe place - some people write them on the CDs with a special CD/acetate Pen (DO NOT use a ballpoint or any other hard tipped pen!). If you cannot find your key this way, or from your registry, you need to contact EA. Where can I get a Key Crack? ModTheSims does not, and will not, in any way shape or form, offer support for or help with the usage of key generators, illegal keys, or any other warez. We will not help with those who have warez versions of the game, nor can we help with no-cd cracks. This page was last modified on 25 February 2013, at 00:46. This page has been accessed 140,922 times.